The information we have about the dinosaurs’ time on earth is gathered from comparatively recent finds. The first skeleton was discovered in 1825, and new finds are still being made, changing what we thought we knew. This is partly what makes dinosaurs so exciting: nobody (no adult) can be one hundred per cent certain about everything, so everybody can join in and guess at how things might have been. Together, fact and fantasy build up our picture of the dinosaurs. And since the facts we already know surpass almost anything we could imagine, our fantasies can start at an extremely high level! 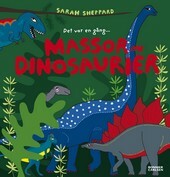 It is precisely this combination of fact and fantasy that makes Sarah Sheppard’s book so good: all the amazing facts are here, but she also uses her imagination when it comes to colours, for example (no, dinosaurs don’t have to be a dirty grey-brown, they might have been bright green or… blue). This is something quite different from the usual run of books about dinosaurs, with their fake ‘photos’ in sepia! "Lots of Dinosaurs" has been written by a real fan of dinosaurs and is aimed at those who feel the same. When Sarah Sheppard is not studying palaeontology at the University of Stockholm out of sheer curiosity and enjoyment, she works as an illustrator and graphic designer.